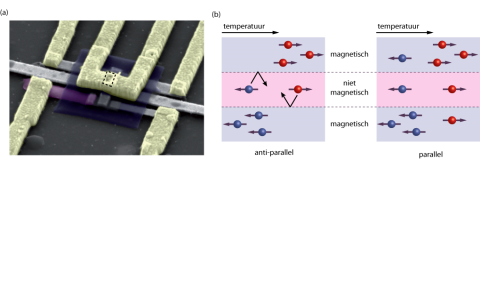 The researchers from this programme have designed a nanoscale thermal switch that they can switch on and off magnetically. In the future we can use these minuscule switches to recycle the excess heat in transistors in chips. Up until now physicists had thought that the temperature of electrons was independent of the direction of their spin. Researchers from the University of Groningen, Delft University of Technology, Tohoku University and FOM have now demonstrated that this is not always the case. They applied a temperature difference to the boundary between a non-magnetic and a magnetic metal. The sign (positive or negative) of the temperature difference determined whether the electrons with a spin parallel to the magnetisation or the electrons with an antiparallel spin, assumed a higher temperature. The electrons with an opposite spin assumed a lower temperature. A temperature difference arose because the heat conduction for the two spin directions in the magnetic layer was different. Researchers used this knowledge to construct a nanopillar with two magnetic layers, with a non-magnetic layer in between. In this pillar they could separately switch the magnetisation of both magnetic layers to influence the heat conduction. The pillar is just 80 nanometres wide – 1000 times smaller than the thickness of a human hair. If the magnetisation in the outermost layers of the pillar is in the same direction, electrons with the same spin direction in both layers will have a higher heat conduction. Consequently heat can easily be transported from one side of the pillar to the other – a high heat conduction occurs. If the magnetisation in the two layers is in opposite directions, the heat conduction is suppressed. The quantity of heat that flows through the pillar can therefore be switched on and off. (a) In this image, made with a scanning electron microscope, the nanopillar is located at the dotted rectangle. A platinum heating element (rearmost of the three grey-coloured strips) causes a temperature difference. A nanothermometer, made up from a nickel-copper alloy (purple) and platinum (foremost grey strip) detects the difference in heat conduction. The middlemost grey strip is a platinum contact that makes contact with the lower side of the pillar and the other coloured parts are gold contacts. (b) Schematic representation of the spin temperatures in the nanopillar. Left a sketch of the situation where the magnetisation in the two magnetic layers is antiparallel. The temperature of the spins on the heated side (top) is higher than that of the second magnetisation layer on the cool side (bottom) and a temperature difference builds up between the two different spin directions. As the spins can scarcely penetrate a magnetic material which has an opposite spin direction, the heat conduction in the antiparallel situation is hindered. In the parallel situation (right) warm electrons can easily move from top to bottom and cold electrons from bottom to top and this ensures a high heat conduction.